If you�ve just rolled out PaperCut Mobility Print, by default your Mobility Print server will broadcast the printers to the local subnet using mDNS� but what does that mean? PaperCut Mobility Print, like Apple�s Bonjour, uses the mDNS protocol to advertise services on the local network. By design the client and server must be in the same subnet for this to work. Please note that there is also another way of advertising the printers using DNS but this is a bit more technical. Generally mDNS is very simple to troubleshoot. Either the clients and server are in the same subnet and it will work, or the clients and the server are in different subnets and it won�t work. To see whether this is the case, you will need to check the IP address and Subnet Mask on the server and see whether this lines up with the settings on the device. On the Mobility Print server open a command prompt or terminal window and run ipconfig (on Windows) or ifconfig (on macOS or Linux). Then look for the IPv4 Address and Subnet Mask. You can enter these numbers into a subnet calculator to see what range of IP addresses are in the subnet. Any device in this subnet should see the printers being advertised. Windows: Open a command prompt window and type �IPconfig� like above. Android: This may vary depending on the make and model, but should be something like Settings > Wireless > WiFi. What if the devices are in a different subnet? Fortunately there are a few different ways to solve this problem. The right solution will depend on how many subnets there are in your network, and whether you have an internal DNS server. 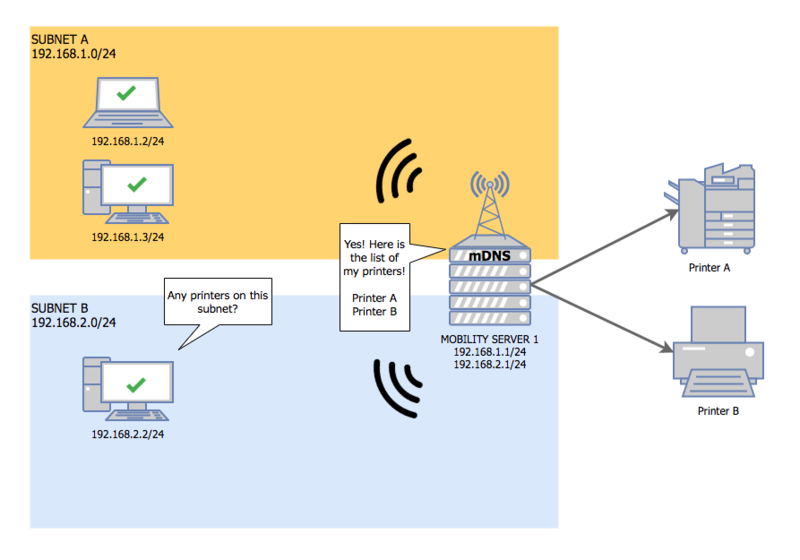 If you have just two networks, such as a wired network and a WiFi network then simply connect the Mobility Print server into both networks. You could do this by adding an additional network interface (such as a WiFi dongle) to the Mobility Print serve to connect it to the second network. The Mobility Print server will automatically broadcast printers on both interfaces, and devices on both subnets will be able to discover the printers. If your organization has an internal DNS server, then you can follow the steps on the Mobility Print admin interface to set this up. Instead of the Mobility Print server broadcasting the printers, devices will check with the DNS server to discover printing services and will be redirected to the Mobility Print server. Chat with your network administrator or IT service provider for more information.